Mondello - I am not sure if Mondello can really be called a town. It really is a suburb, perhaps even an extension, of Palermo and a favorite spot for the palermitani to go in the summer when the village is really hopping. There is not much to do there other than sit on the beach and eat, but really, what is a beach vacation all about anyway? There is a bar owned by an American whose name I have long forgotten He apparently came to Mondello every summer with his family, then fell in love and stayed on forever. The bar in the main is typical of Sicilian elegance, offering all sorts of the island’s specialties, including almond granita and croissants filled with almond paste. There are also fabulous seafood restaurants with the freshest bounty you can imagine. Ricci (sea urchins) are brought directly from the boat and to the table. 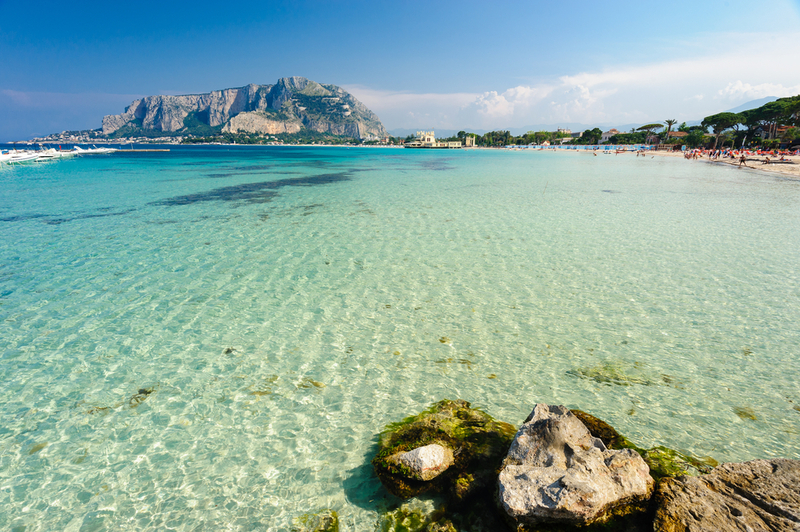 Mondello is a great place from which to explore the western side of the island – day trips to Palermo, Cefalù, Segesta and Sellinunte are quite doable, as is a stop at our next village, Erice. Erice – You might think you are in Umbria or Tuscany if you didn’t know better. Erice is a medieval town about 750 meters above sea level with an incredible view of the sea. It is a great stop for a day or half day. The local specialty is fish with couscous – a nod to the influence of African and Middle Eastern cultures. Have a leisurely lunch the Italian way followed by an afternoon passegiata. And if the only reason you stop in Erice is to pick up a tray of almond pastries from Maria Grammatico’s pastry shop, you trip will not be wasted. Piana degli Albanesi I have only been to this town once but it left such an impression that I needed to mention it, especially as we are close to Easter week. The people of Piana degli Albanesi, as the name implies, are descended from the Albanian people settled in Southern Italy during the Ottoman Empire. Their dialect is a derivation of Italian, Sicilian and Albanian and in fact all townspeople are bilingual (Albanian and Italian) and Albanian is recognized by the government as a minority language. The Easter celebration in Piana degli Albanesi is truly unique – the town has preserved ancient Albanian traditions. The townspeople all participate beginning with the reading of the Gospel in seven languages. This is followed by a procession through town with all the men and women in traditional dress. After a blessing in the main square, red eggs are distributed to all as a sign of Christ’s resurrection. Oh, and if that isn’t enough: Piana degli Albanesi has produced what is considered the best cannoli in Sicily (and therefore the world). I’ll cover more of Sicily’s small towns in a later blog post – what a fabulous island!